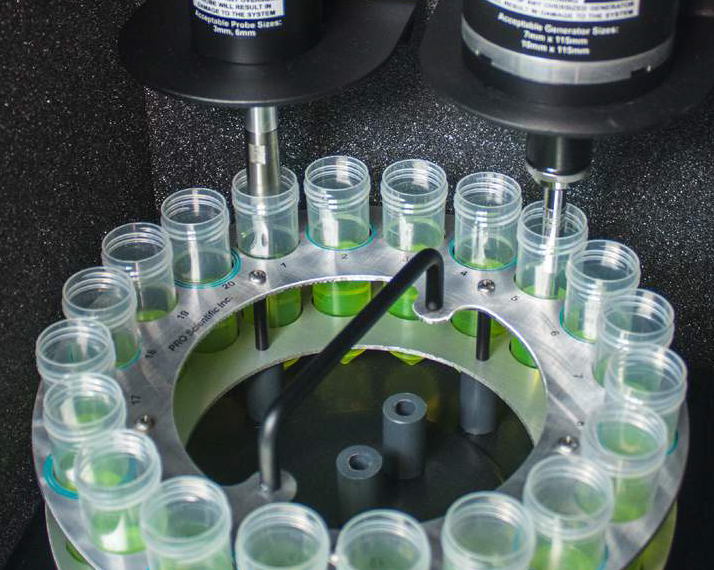 Oftentimes preparation of your samples will call for Two Step Homogenizing. The first step in the process, which is frequently done mechanically, is to reduce the overall size of the sample to coarse particles, while the second step is the further reduction of these particles to a submicron or nano level and is achieved by sonication. The downside of traditional two-step homogenizing is that it requires two separate pieces of equipment: a mechanical homogenizer and an ultrasonic homogenizer. Switching equipment slows down throughput and lowers productivity. The DPS-20 Homogenizing System revolutionizes Two Step Homogenizing and doubles your homogenizing efficiency by combining two methods of homogenizing, mechanical and ultrasonic into one automated system. The automated control of the DPS-20 means no switching of equipment within the lab and this allows for quick, effective and repetitive processing, meaning you will get the results you want each and every time.